I went to ‘my’ Stencil quilt class on Sunday, taught by Dan Rouse. He is a lovely man. Super stylish and understated. The ladies in the class are all fans of his, and I came to learn that he had recently met Jay McCarroll! In New York! And THEN, the story came out, Dan submitted a quilt to Jay’s contest, and won! HABITAT was selected as the winning quilt, and Dan spent 12 days in New York! Man-o-man! Congratulations. I ran into class, 2 minutes after noon, and I was the last to arrive. I quickly sat down, and listened to Dan’s introduction. He motioned over to ‘this quilt’ referencing something technical, and I turned my head around to see the quilts on the wall. I must have gasped out loud, because someone chuckled in agreement. 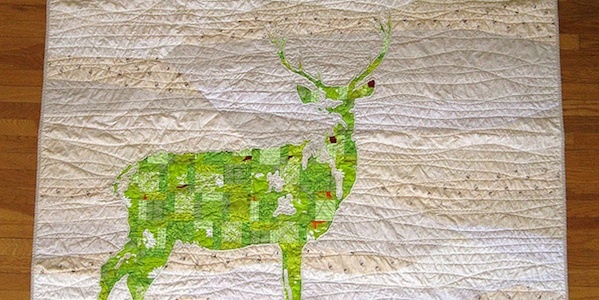 And here is the Stag Quilt, again, for your viewing pleasure. What a pleasure to be in the class, and meet Dan, and ALL the amazing quilters in the room. Stay tuned to see how my efforts are progressing. 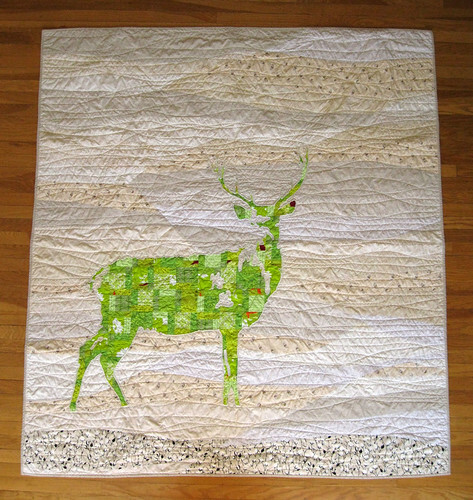 8 years ago by Susi in Needlecraft , Quilting | You can follow any responses to this entry through the RSS feed. You can leave a response, or trackback from your own site. I bet it really is amazing in person! I’m one of your classmates and I totally agree with you. Those quilts were so much more breathtaking in person and Dan was super nice and humble. I was so excited when the class was announced and am so glad to be taking it. I can’t wait to see everyone’s progress when we meet again for part 2. Thanks for posting the unicorn photo; I hadn’t seen that one yet. I think the lizard/dinosaur is still my fave! See you next class! Wow. I would love to see these in person. How neat. I am in awe of people who can create like this. he is a very talented artist! love his work! Pingback: The Spider and the Victim « I want to cut you!